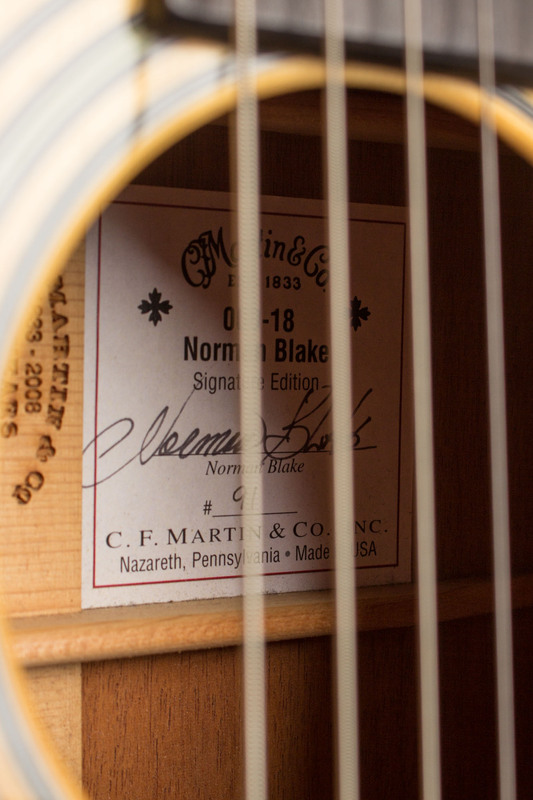 C. F. Martin 000-18 Norman Blake Signature Model Flat Top Acoustic Guitar (2008), made in Nazareth, PA, serial # 1269968, natural finish, mahogany back, sides and neck; spruce top, ebony fingerboard, original black tolex hard shell case. 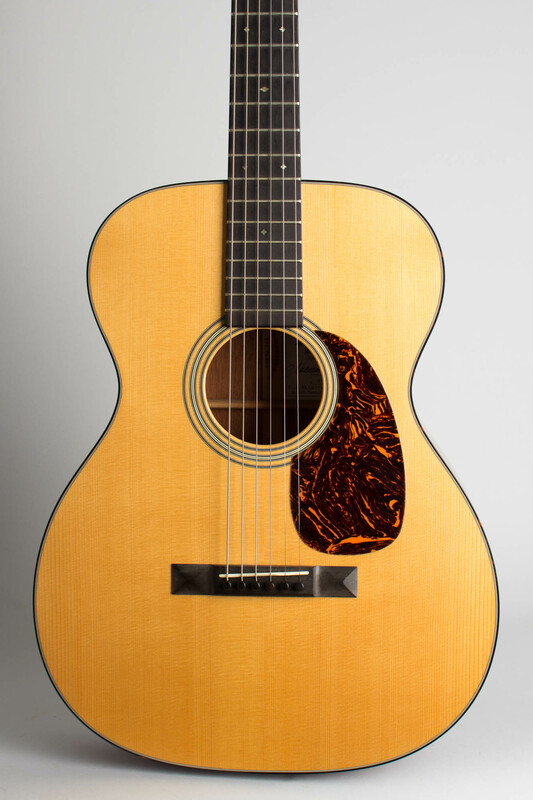 Martin's Norman Blake Signature 000-18 is quite an interesting take on the "vintage guitar that never was". 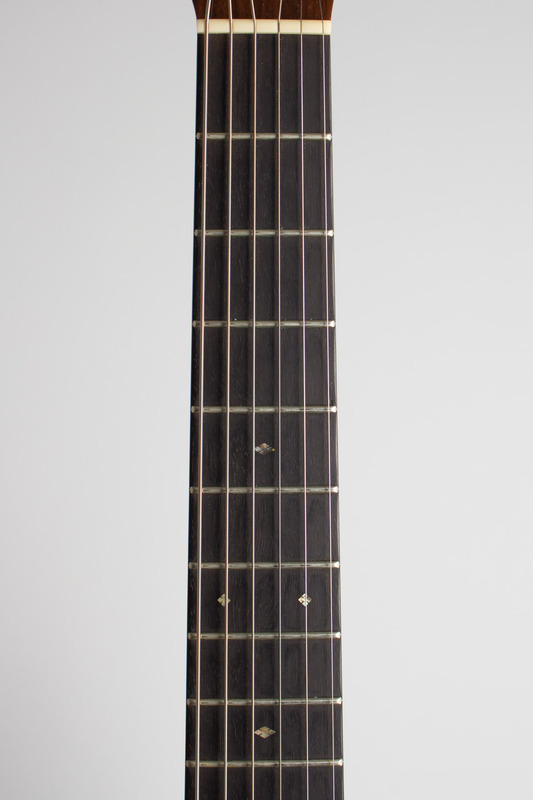 It is built on a double bound 000 size body shaped like a 14 fret model, but the neck actually joins at the 12th fret. This results in the bridge being located nearer the center of the lower bout, adding depth to the tone and strengthening the bass response. 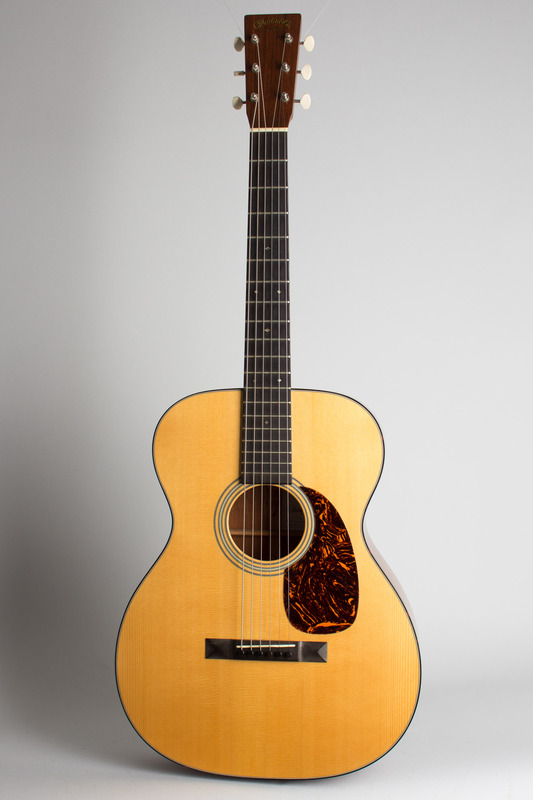 It's sort of a Martin version of the early 1930's 12-fret Gibson L-0 that Norman is known to favor. Other features include mahogany back and sides, an Italian spruce top, scalloped braces and modified V-shape neck with a 19 fret ebony fretboard inlaid with small pearl diamonds. 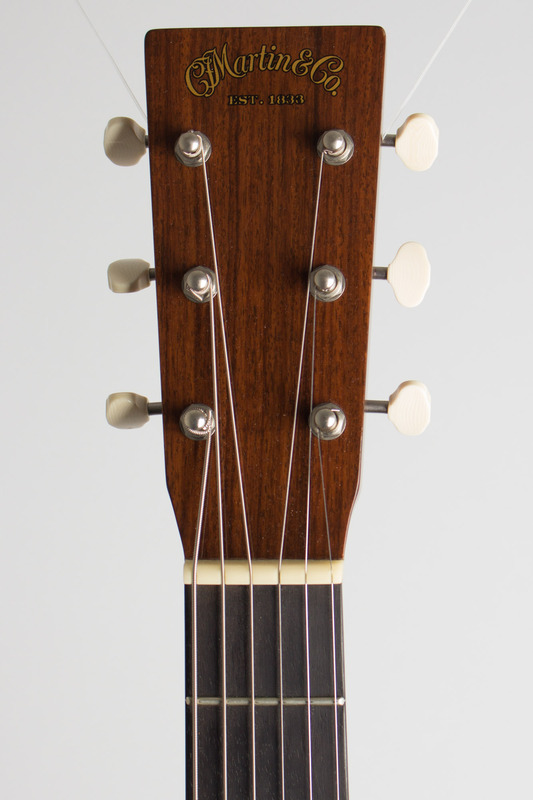 The top has an ebony pyramid bridge, a Style 28 rosette, tortoise plastic pickguard and binding. 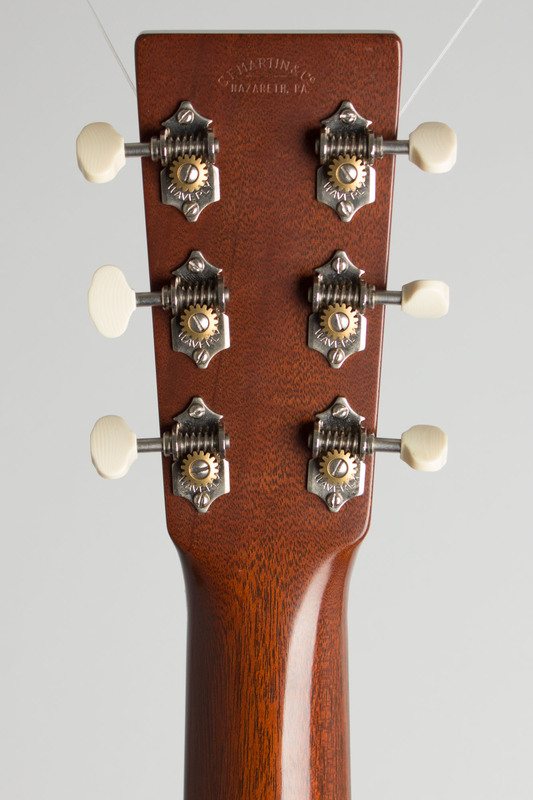 The headstock overlay features Golden Era decal and Waverly open gear tuners with ivoroid buttons. The label is signed by Blake, and identifies this one as #91 of the limited edition. There is a K&K Pure Mini pickup installed for amplified use. Overall length is 38 1/4 in. (97.2 cm. ), 15 3/16 in. (38.6 cm.) wide at lower bout, and 4 in. (10.2 cm.) in depth at side, taken at the end block. Scale length is 24 3/4 in. (629 mm.). Width of nut is 1 13/16 in. (46 mm.). 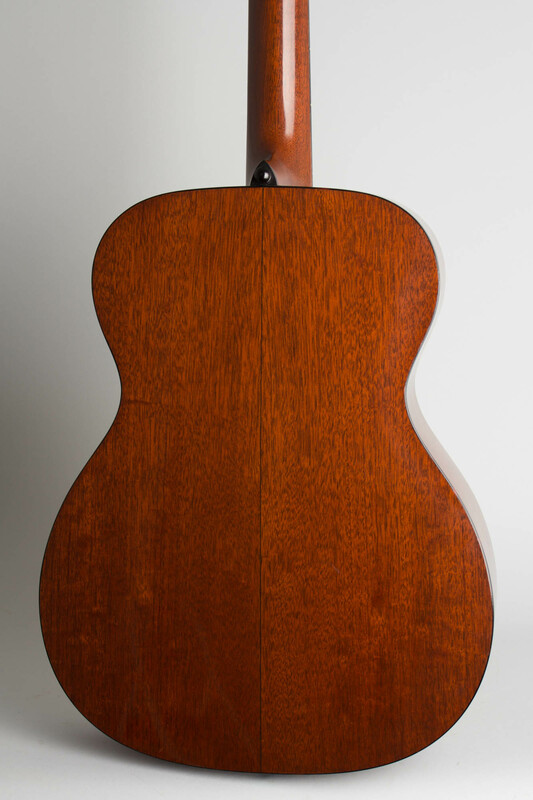 This guitar shows some small dings and dents to the finish, but overall not much in the way of wear, and no damage or repair. There is a strap button on the heel that looks added. This is a unique feeling guitar with a lot of sound for a 000 size instrument, with a very strong bass but still extremely well balanced. 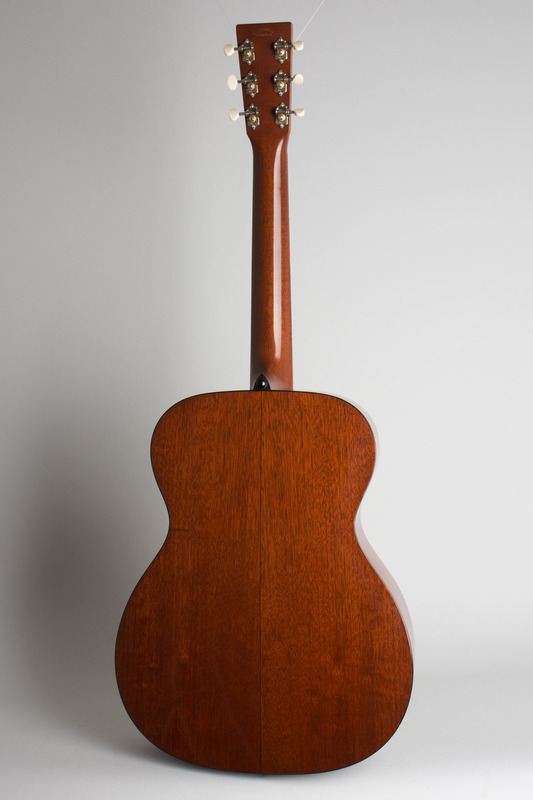 One of the more interesting and distinctive modern Martins we have seen, not a fancy guitar but a delightful instrument. 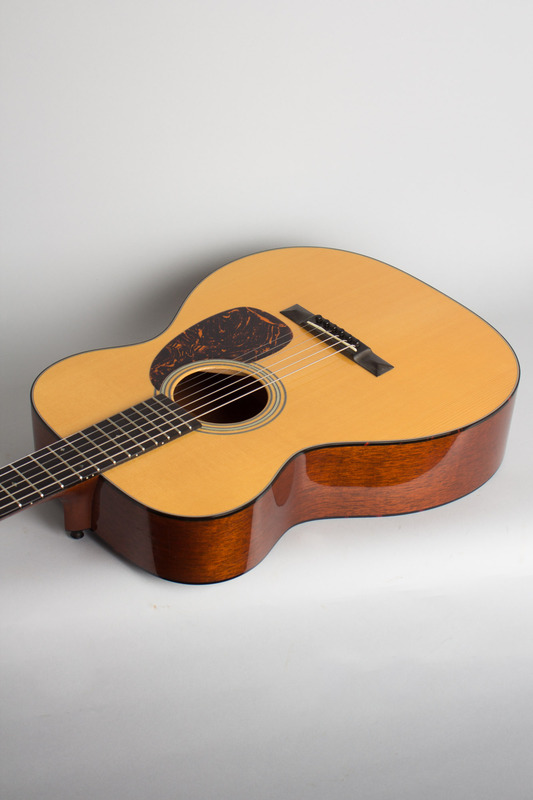 This model is a great example of how "modern vintage" ideas can create exceptional results- this guitar that should have existed in 1930 but had to wait till 2007! It is a very versatile guitar but we have to admit it seems to sound especially good for the sort of open-chord flatpicking Norman Blake specializes in, and fingerpicking works great as well. Excellent + Condition.